The Asia Pacific region is set to remain the most dynamic performer in global growth in the medium term. This outlook is based on strong economic growth rates expected in most of the countries in the region. These rates range from 2.5% in Hong Kong to more than 5% in Indonesia, with India in the lead (real economic growth is forecast at more than 7% this year), taking over China’s role as the main engine of growth. Although China’s managed slowdown might lead to an increase in insolvencies in the country, thus triggering a ripple effect in other emerging markets, its decelerating economic growth is not forecast to deteriorate the outlook for the region, which anticipates stable high growth for the medium term. Against this backdrop, businesses in Asia Pacific appear to make broad use of trade credit in both domestic and foreign B2B transactions. As our survey reveals, 91% of the respondents across the countries surveyed in the region (Australia, China, Hong Kong, India, Indonesia, Japan, Singapore and Taiwan) reported having granted trade credit to their B2B customers over the past year. This is slightly more than in the Americas (89%) and significantly more than in Europe (76.2%). By country, Australia and Japan are the most conservative, while India and Hong Kong show the most liberal stance towards offering trade credit terms to their B2B customers. In the remaining countries surveyed, respondents show some selectivity towards their B2B customers, with credit-based sales ranging from between 35% and 60% of their domestic and foreign sales. A breakdown by percentage of domestic and foreign B2B sales in the region points to a stronger propensity to sell on credit to B2B customers domestically than abroad. This pattern, which indicates an inconsistent perception of payment default risk arising from domestic and foreign trade, is similar to that observed in the Americas and Europe. On average, 50.6% of the total value of domestic B2B sales in Asia Pacific were made on credit, compared to 42.5% of sales made to foreign B2B customers. The averages for the Americas are 49.3% for domestic sales and 40.1% for foreign sales; while for Europe, the averages are 44.3% domestic and 37.9% foreign. These findings highlight that businesses interviewed in Asia Pacific, the Americas and Europe perceive selling on credit on familiar domestic markets to be less risky, in terms of customers’ payment default, than selling on credit to foreign customers. For export-reliant economies, protecting exports from the risk of payment default due to commercial and political problems comes as no surprise. Despite the great openness to trade credit shown by respondents in Asia Pacific, there are some differences by country. In China, survey respondents show a clear-cut preference for requesting payment from B2B customers on cash terms or on terms other than trade credit. This selective approach to the use of trade credit particularly applies to sales to B2B customers abroad. 41.8% and 34.2% of the average total value of domestic and foreign B2B sales of Chinese respondents was transacted on credit. The foreign figure for China is the lowest of the countries surveyed in the region. 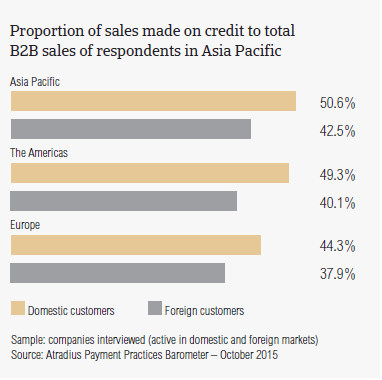 In contrast, Japanese respondents, appear to have the highest value of domestic and foreign B2B sales made on credit. Credit sales averaged 60.4% of the domestic and 52.7% of the foreign B2B sales value in the country. In most of the remaining countries surveyed, the total value of domestic credit-based B2B sales is almost equal to, or not markedly below, the regional average with Indonesia at 50.5%, Hong Kong at 49.8%, India at 48.2% and Australia at 46.5%. In Singapore and Taiwan, conversely, the domestic figures are above the average of the region (53.3% and 54.3% respectively). In respect to foreign trade, despite the observations above, the proportions of credit-based sales in India (39.3%) and Hong Kong (40.9%) are lower than the 42.5% regional average. A broader use of trade credit in sales to B2B customers abroad was observed in Taiwan (43.8%), Australia (45.3%), Indonesia (46.3%), and Singapore (45.2%). Over the past year, the proportion of B2B sales on credit (both domestic and foreign) in the region increased, on average, by 3.2 and 5.5 percentage points respectively. Domestically, the increase in credit-based B2B sales in Hong Kong, Singapore and Taiwan was twice as high as the regional average. As to foreign trade, Japan stands out with a percentage point increase that is three times higher than that for the region. The above mentioned statistics point to a markedly less selective approach in both domestic and foreign trade credit decisions adopted by respondents in these countries, compared to their peers in the region. Both domestic and foreign B2B customers of respondents in Asia Pacific are given an average of 33 days from the invoice date to pay for goods and services purchased on credit (the Americas: 28 days; Europe: 32 days). By country, respondents in Australia set the shortest payment terms for B2B invoices, averaging 20 days from the invoice date. At the other end of the scale, Japan extends the most relaxed payment terms in the region (averaging 47 days). Notably above the regional average are also the payment terms extended by survey respondents in Taiwan (averaging 41 days). In the remaining countries surveyed, average payment terms range from 26 days in Indonesia to 37 days in China. Payment terms for domestic and foreign customers vary across countries. In Taiwan and Japan, domestic customers are given slightly longer terms to pay invoices than customers abroad, whereas in China and Hong Kong it is the opposite. In Australia, Singapore, Indonesia and India, no big difference between domestic and foreign payment terms was observed. Over the past two years, average payment terms in most of the countries surveyed in Asia Pacific have shown marked variations. In Japan and China, invoice payment terms for both domestic and foreign B2B customers are now, on average, up to three weeks longer than two years ago. Respondents in Hong Kong extended longer payment terms than two years ago, particularly in B2B transactions with customers abroad. Indonesia, however, recorded a marked shortening of the payment terms extended to domestic B2B customers, as did India in relation to payment terms offered to customers abroad. 90.2% of the survey respondents in Asia Pacific (down from 97.5% in 2014) reported having experienced late payment of invoices from their domestic and foreign B2B customers over the past year (94.7% respondents in the Americas and 92.8% in Europe). Across most of the region, the percentage of respondents reporting late payment from B2B customers varies markedly. It is the highest in India at 97%, it is below the regional figure in Taiwan at 87.9%, dropping to a low of 63.2% in Japan. In all of the remaining countries surveyed, the percentage of respondents reporting late payments by B2B customers’ is above the regional average but do not exceed 95.4%. Domestically, the above statistics correspond to an average of 44.8% of the total value of domestic B2B invoices which remained outstanding at the due date (average for the Americas: 46.1% and for Europe: 40.2%). By country, the average total value of domestic overdue invoices is the highest in India at 53.5%, and the lowest in Japan at 24.8%. In the remaining countries surveyed, it ranges from a high 51.3% in Hong Kong to a low 42.9% in Indonesia. Foreign B2B invoices paid late represent 45.2% of the average total value of respondents’ export sales on credit (average for the Americas: 49.1% and for Europe: 35.4%). By country, the regional average is highest in Australia (63.1%) and in Hong Kong (50.3%), and lowest in Japan (28.7%) and in Indonesia (39.3%). Around one-fourth of the total value of B2B receivables in Asia Pacific were reported to be still outstanding after more than one month past due. The proportion of past due receivables still unpaid after 90 days or more averages around 10% of the total value of B2B invoices. Long overdue invoices of foreign B2B customers outweigh those of domestic customers. The averages for the Americas stand at 12.2% domestic and 16% foreign; and for Europe 7.6% domestic and 7% foreign. The longer receivables remain outstanding, the higher the likelihood that they turn into bad debts and write-offs, negatively impacting businesses’ cash flow and profitability. Most of the countries surveyed (Australia, China, Hong Kong, India and Indonesia) show domestic figures notably above the regional average, but not exceeding 15%. Below the regional average are figures for Singapore (7.8%), Taiwan (5.9%) and Japan (3.9%). As to foreign trade, Australia and India record figures above the regional average (22% and 14.5% respectively). Indonesia stands at 11.5%, and in the remaining countries, the percentage of long overdue payments ranges from 9.6% in Hong Kong to 5% in Japan. Late payment of invoices in Asia Pacific is reflected in the respondents’ Days Sales Outstanding (DSO) figure which averages 35 days (the Americas: 30 days and Europe: 50 days). This is almost three weeks fewer than in 2014, which is likely to reflect a priority given to the collection of high value invoices across many of the countries surveyed. This seems to hold true for Australia, showing the lowest DSO figure at 18 days, and for Hong Kong, India and Indonesia which record an average DSO of 36 days or less. Above the regional average is the DSO in China (averaging 39 days), Japan, Singapore and Taiwan (averaging 40 days each). This finding would suggest that, in these countries, the B2B invoices that take longer to be paid by customers are of higher amounts. For this reason, businesses in these countries would be more likely to be exposed to the risk of customers’ payment default than their peers in the region. By comparing the 2015 survey to previous years, one notes that insolvency rates in Asia Pacific have been below the pre-crisis levels since 2010. The current outlook indicates, however, that the managed slowdown of the Chinese economy could lead to an increase in insolvencies in the country, potentially triggering a ripple effect on other economies in the region. 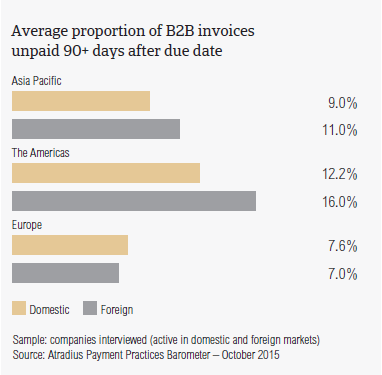 Domestic B2B customers of respondents in Asia Pacific settle payment on past due invoices, on average, not later than 25 days after the due date (compared to 30 days in the Americas and 22 days in Europe). Foreign B2B customers make their overdue payments, on average, 28 days after the invoice due date (the Americas: 37 days; Europe: 20 days). Average payment delays from B2B customers vary notably across the countries surveyed. Domestic and foreign B2B customers of Japanese respondents settle their past due payments the swiftest (on average not later than two weeks after the due date each). Conversely, it takes domestic and foreign B2B customers of respondents in Australia the longest to pay overdue invoices (an average of 35 days and 51 days after the due date respectively). A comparison between the average payment delays recorded in Australia, and the contracted payment terms set by suppliers (the swiftest in Asia Pacific), suggests that setting short payments terms for B2B customers does not improve their payment behaviour. In the remaining countries surveyed in Asia Pacific, payment on domestic overdue invoices is made, on average, between 26 days (Indonesia) and 41 days (Taiwan) after the due date. Foreign overdue invoices are paid, on average, between 24 days (Indonesia) and 41 days (China) after the due date. Over the past year, the average domestic payment delay did not vary significantly across most of the region. The exceptions are Australia, where it increased by an average of 10 days, and Singapore, where it decreased by an average of one week. The trend in payment delays from customers abroad was slightly more volatile. Respondents in Japan, Singapore and Taiwan receive foreign past due payments, on average, one week earlier than two years ago. Respondents in Australia, in contrast, now have to wait around three weeks longer to get paid on past due foreign invoices. Given the above, respondents in India have to wait the longest to receive payment on past due invoices from domestic B2B customers. In terms of payments from customers abroad, respondents in China wait the longest. As B2B payment timings lengthen, so do financial and administrative costs of carrying outstanding receivables. Timely collection of past due invoices, means quick turnover of working capital invested in receivables. Therefore, it should be a key feature in the receivables management strategy, in order to avoid cash flow issues and shrinking profit margins. 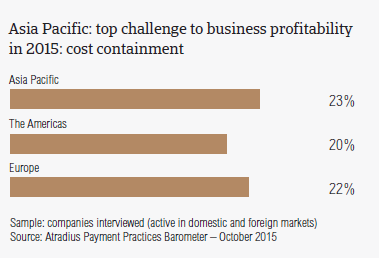 This may explain why, consistent with observations in the Americas and in Europe, many of the respondents in Asia Pacific (23.0%) consider cost containment to be one of the biggest challenges to business profitability this year. This appears to concern respondents in Japan the most (around 33% of respondents). Singapore and China follow with a 30.1% and 28.6% response rates respectively. Respondents in Australia and Singapore (nearly 22% each, compared to 17.4% at survey level), in contrast, appear to be more challenged by a likely fall in demand for their products and services. Respondents in India (16% vs. 9.8% at regional level) consider collection of outstanding invoices to be the biggest challenge to generating profits and maintaining adequate cash flow levels. In line with observations in the Americas and in Europe, most of the respondents in Asia Pacific (46.3%, down from 47.3% one year ago) reported that late payment of domestic B2B invoices is mainly attributable to their customers’ insufficient availability of funds (respondents in the Americas: 46.4% and in Europe: 53.8%). It is therefore vital for suppliers to have comprehensive knowledge and regularly updated information on their customers’ financial strength and stability. By country, late payment from domestic customers due to liquidity constraints was most often experienced by respondents in China (62%). Response rates across the other countries surveyed range from 50.5% in Indonesia to 20.7% in Japan. The second most frequently reported reason for domestic payment delay (29.6% of respondents, compared to 32.8% in the Americas and 34.3% in Europe) is the perception that postponing invoice payment is intentional, which means that customers use trade credit as a way of alternatively financing their business operations. By country, the regional percentage is the highest in India at 38.8%, and the lowest in Taiwan at 21.7%. In the remaining countries surveyed, the response rate for this reason ranges from 36.5% in Singapore to 27.3% in Hong Kong. The complexity of the payment procedure appears to be the most frequent reason for late payment of invoices from foreign B2B customers. This was reported by 39.4% of respondents in Asia Pacific, slightly more than the 33.6% in the Americas and significantly more than the 27% in Europe. Respondents in Indonesia (50%) and India (nearly 43%) reported to have experienced this delay reason most often. An interesting finding is that, on average, two in five respondents in Singapore, China and Hong Kong reported that foreign B2B customers most often delay payment on past due invoices claiming they have liquidity issues. An average of 2% of B2B receivables of respondents in Asia Pacific was reported to be written off as uncollectable (the Americas: 2.2% and Europe: 1.2%). After an average 1.4 percentage point decrease in 2014, the above mentioned rate increased again slightly (less than 1 percentage point) at the beginning of this year. By industry, uncollectable domestic and foreign B2B receivables in Asia Pacific stem mostly from the construction, consumer durables, electronics and business services, and overall services sectors. On a country basis, the proportion of B2B receivables written off as uncollectable is the highest in Hong Kong (2.3%), followed by Taiwan, Indonesia and India (with 2.2% each). In the other countries surveyed, it is almost equal to, or slightly less than the average for the region. In Japan, the proportion of write-offs drops to a low 1% . By comparing the proportion of outstanding B2B receivables with the proportion of trade debts written off as uncollectable, we notice that, on average, businesses in Asia Pacific lose around 65% of the value of their domestic, and 47% of the value of their foreign B2B receivables that are not collected within 90 days after the due date (averages for the Americas: 49.2 domestic and 34.4% foreign and for Europe 60% overall). Split by country, our survey findings evidence that efforts to collect delinquent B2B accounts seem to be less successful in Hong Kong and Taiwan than in the other countries surveyed in Asia Pacific. Overall, B2B receivables in Asia Pacific were reported to be uncollectable most often due to the customer being bankrupt or out of business (54.4% of respondents, an equal percentage to that of the Americas, and 63.6% in Europe). This was particularly the case in Indonesia (67.1% of respondents) and in Japan (63.7%). This reflects the challenging business climate in which many businesses in the region still operate. The second most often cited reason for domestic and foreign write-offs (just over 38.6% of the respondents in the region) was the failure of collection attempts. This was most often reported by respondents in the Australia (nearly 51%). For 35.5% of the respondents, write-offs were caused by customers who could no longer be located. Again this was experienced most often by respondents in the Indonesia (41.8%). Survey respondents in Asia Pacific reported having granted trade credit mainly to B2B customers in the chemicals, construction, consumer durables, food, electronics, metals and services (financial and business) sectors over the past year. B2B customers in the electronics, metals and machines sectors were extended the most relaxed payment terms (averaging 34 days, 39 days and 41 days from the invoice date respectively). Average payment terms (domestic and foreign) do not differ significantly across the sectors. The highest proportion of late payments are generated by domestic and foreign B2B customers in the construction and consumer durables sectors sector (around half the total value of B2B invoices in both sectors is paid late). Late payments from domestic B2B customers of respondents in Asia Pacific due to insufficient availability of funds are reported to occur most often in the construction sector (nearly 70% of respondents). The majority of the respondents in the region don’t expect significant changes in the payment behaviour of domestic B2B customers over the next 12 months. However, a sizeable percentage of respondents (around 33%) in both the chemicals and the consumer durables sectors expects the payment behaviour of domestic customers to worsen over the same time frame. Payment delays on foreign B2B invoices due to the complexity of the cross-border payment procedure appears to occur almost equally often across all of the industries surveyed (around three in five respondents overall). The majority of the respondents in Asia Pacific don’t expect changes in the payment behaviour of foreign customers over the next 12 months. Three in five respondents expect a slight deterioration of the payment behaviour in the construction and consumer durables sectors. For more insights into the payment practices by industry in each of the countries surveyed in Asia Pacific, please refer to the respective country reports which are an integral part of the 2015 edition of the Atradius Payment Practices Barometer for Asia Pacific. Free download on atradius.com.